In advance of the Fourth of July festivities, The Yakima Herald of Yakima, Washington, published the various races, competitions, and events to be held, including the categories of races and the significant prizes to be awarded to winners. Notice that Yakima, Washington (in 1896) sported a bicycle track and ball grounds (both quite common in larger towns and cities in the United States in the 1890s). 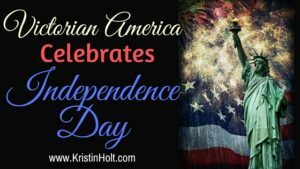 Looking back on the planned events for July 4, 1896 (122 years ago on the day this post is published), I’m surprised (but not surprised) to see the various categories of events–and the non-PC (non-politically correct) terms and events listed. Would anyone post “Fat Woman’s Bicycle Race” today? Or “Squaw Race on Horses“? No, of course not. But in 1896, such terms (e.g., “Indian”) were not only common, they were acceptable. We’ve come a long way in the right direction in the intervening years. I must wonder… Did any woman dare enter the “Fat Woman’s” race? Independence Day Races. The Yakima Herald of Yakima, Washington on July 2, 1896. Part 1 of 2. Independence Day Races. The Yakima Herald of Yakima, Washington on July 2, 1896. Part 2 of 2. 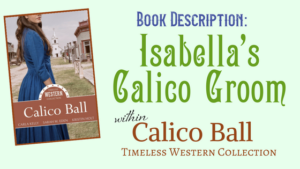 My new release, Isabella’s Calico Groom (within Calico Ball: Timeless Western Collection, Book 1), features the historical occasion of Wyoming’s acceptance as the 44th state in the United States of America. As a territory (as with all territories in the west), Wyoming celebrated Independence Day each July, and did so the same week that their territory achieved the long-sought prize of statehood. Pursuant to call the committee on arrangements for the Fourth of July celebration met yesterday afternoon at the office of Chairman Bentley. A general plan of celebration was decided upon and the chairman authorized to notify the chairman of the finance committee the amount of funds necessary to be raised to defray the expenses. It is hoped the citizens will not underestimate the importance of this matter. 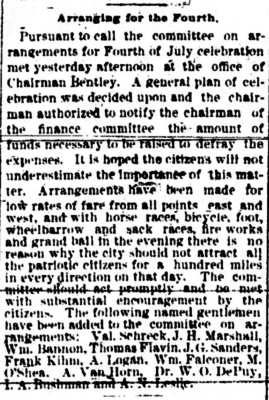 Arrangements have been made for low rates of fare from all points east and west, and with horse races, bicycle, foot, wheelbarrow and sack races, fire works and grand ball in the evening there is no reason why the city should not attract all the patriotic citizens for a hundred miles in every direction on that day. The committee should act promptly and be met with substantial encouragement by the citizens. The following named gentlemen have been added to the committee on arrangements: Val. Schreck, J.H. Marshall, Wm. Bannon, Thomas Flavin, J.G. Sanders, Frank Kihm, A. Logan, Wm. Falconer, M. O’Shea, A. Van Horn, Dr. W.O. DePuy, I.A. Bushman and A.N. Leslie. ~ The Bismarck Tribune of Bismarck, North Dakota on June 5, 1888. The Bismarck Tribune of Bismarck, North Dakota on June 5, 1888. 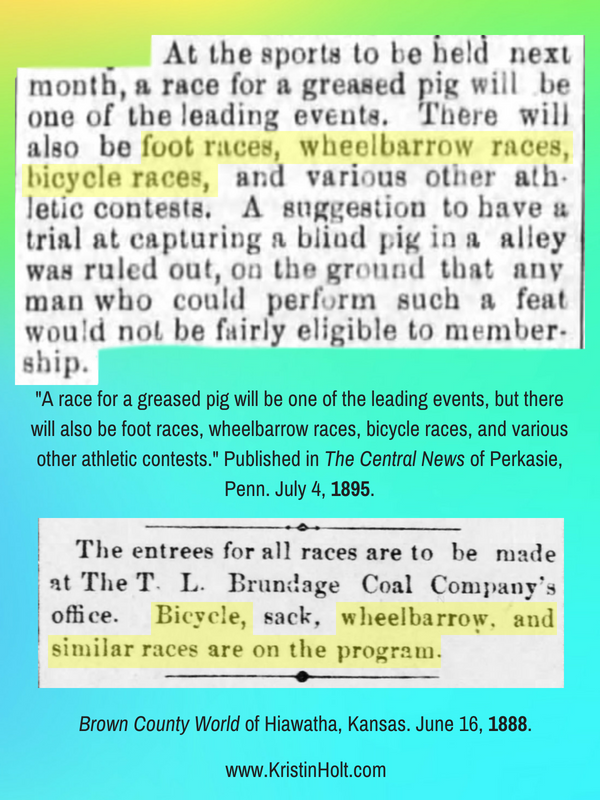 “Race for a greased pig will be one of the leading events.” The Central News of Perkasie, Pennsylvania on July 4, 1895. 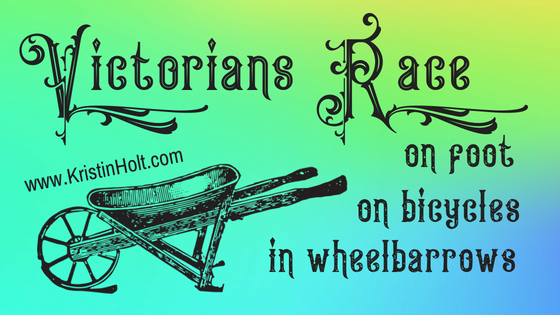 Many of the same traditional races: foot races, wheelbarrow races, and bicycle races occurred in Perkasie, Pennsylvania and in Hiawatha, Kansas (published in Brown County World on June 16, 1888). 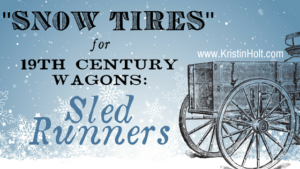 … along with foot races, “wheel-barrow” races, sack-races, jumping, hammer throwing, and more! 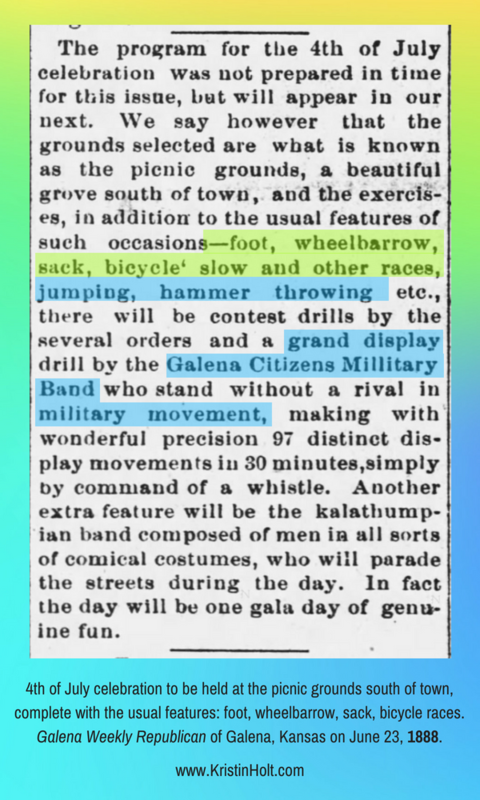 Fourth of July Celebration to be held at the picnic grounds south of town, complete with the usual features: foot, wheelbarrow, sack, and bicycle races. Galena Weekly Republican of Galena, Kansas on June 23, 1888. 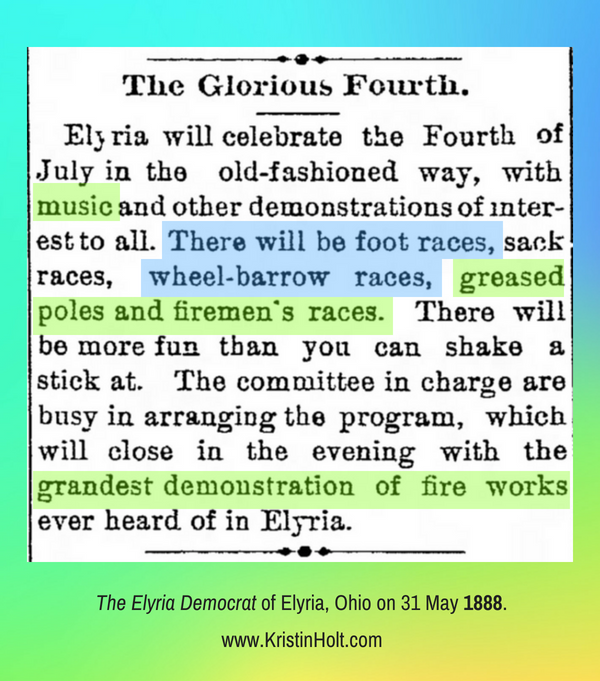 The Elyria Democrat of Elyria, Ohio on May 31, 1888. Notice reference to “the committee in charge.” Then, as now, much work goes in to public occasions such as this. I enjoyed forcing Dr. Isabella M. Pattison, DDS into association with Dr. Henry M. Merritt, DDS–because the two had never met (or should I say, he’d never allowed anyone to introduce him to her?). The mechanism for forcing the pair to meet one another, and work together? The committee they’d been persuaded to participate in, that of the Evanston City’s professionals. Medical doctors, dentists, attorneys, engineers and the like, all in charge of the grand gala calico ball to be held at the conclusion of the glorious week celebrating Independence Day and Statehood for Wyoming. 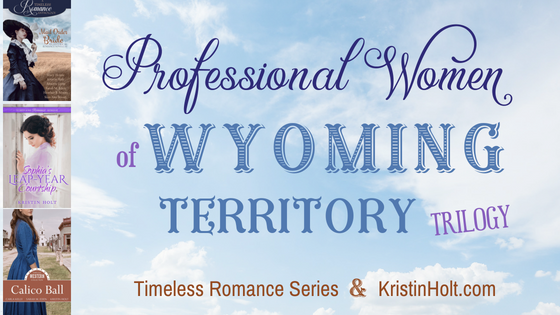 You won’t want to miss out on this third installment in my Professional Women of Wyoming Territory Trilogy. 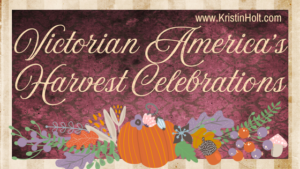 You’ll discover much more about my newest title (Isabella’s Calico Groom) by visiting its page here on my site (with links to many other blog articles about various historical elements touched on in the novella), or by browsing this title’s Pinterest board. Note: Calico Ball: Timeless Western Collection contains THREE 100-page sweet and wholesome Western Historical Romance Novellas–all about a calico ball. 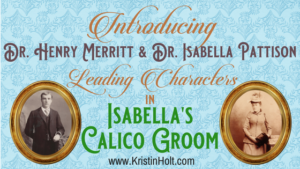 On Sweet Americana Sweethearts: Introducing Dr. Henry Merritt and Dr. Isabella Pattison, Leading Characters in Isabella’s Calico Groom.